DNA Specimen Provenance Assay (DSPA) is a DNA test used to definitively ascribe patient identity and rule out specimen contamination (i.e. assure the specimen purity) when making the diagnosis of cancer and other histopathological conditions. A panel of 16 microsatellite short tandem repeat (STR) markers that recognizes highly variable loci of human DNA is used in a PCR-based assay and analyzed by capillary electrophoresis. The 16 STR loci range from approximately 75 to 400 base pairs in length, and are highly polymorphic in the human population. The collective data from this panel provides a genetic profile, or ‘DNA fingerprint,’ representing the individual. To complete the diagnostic testing cycle for cancer, the genetic profile from the putative malignant specimen(s) is compared with the genetic profile derived from the patient’s DNA reference sample taken via cheek swab at the time of the biopsy procedure. View the PDF file below for a more detailed explanation of the four stages in DSPA testing. The Know Error DSPA process begins with the collection of the patient’s DNA reference and submitting it to Strand Diagnostics. The normal biopsy process continues with the tissue specimen(s) being submitted to pathology for evaluation. If the tissues are positive for cancer they are then sent to Strand Diagnostics from the pathology laboratory for DSPA testing. 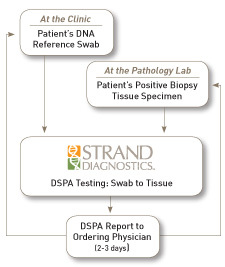 Strand then performs the DSPA test by comparing the DNA profile of the reference swab to the DNA profile of the cancerous biopsy tissue specimen. A report is then issued to the ordering physician confirming a DNA match or non-match of each specimen tested.